Every day, thousands of companies send out thousands more shipments to locations throughout the country; and we rely on transportation by land, air, and sea in order to get these shipments to their destinations. 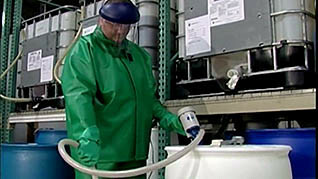 Some of these products require special care in handling; those containing hazardous materials. Handling hazardous materials is of particular importance because of the obvious dangers they pose to your health; in the United States alone, there are over 800,000 shipments of hazardous materials every day. The U.S. Department of Transportation has developed a set of materials specifically addressing the transportation of hazardous materials, and you will learn about them through this training video. There are several key elements you must gather from these HazMat regulations, including the different classes of hazardous materials, how to properly label them, and, more specifically, how best to package and ship each substance. Learn all of these components, and others, through the material presented here. Utilize this lesson, and the HazMat regulations, in order to protect yourself and others from the inherent risks hazardous materials pose during transport.